Boehner's staff complains about the "GTL" cartoon of Boehner  golf, tan and lobbyists, a Washington-insider version of Jersey Shore's gym, tan and laundry. But it's not just Boehner's enemies who compare him to Dean Martin or Mad Men's Don Draper  he can't even sit in a congressional hearing for an hour without ducking out to puff his Camel Lights 100s. He drinks his share of Merlot and hangs out with a crowd of influence peddlers in what's known as Boehnerland. He's a frequent flyer on corporate jets and successfully fought a ban on privately funded congressional travel in the 2007 ethics-reform bill. This election cycle alone, special interests have paid for him to take 40 trips worth $158,000. Just hours before his victory speech, he held court at his favorite Washington restaurant, Trattoria Alberto, with his 40 closest friends and advisers, the bulk of whom are corporate lobbyists. He's often mocked around the Hill as a dandy. His friends razz him for fastidiously washing and ironing his own shirts; he's always been fond of cologne, and he can't resist making fun of just about anyone with a bad haircut or a too-short tie. And yes, he loves golf. He has said that's how he acquired his otherworldly tan. But Boehner is often underestimated. He may prefer the Weather Channel to Fox News, but he's still a fierce partisan who united every House Republican against Obama's stimulus and health care plans and all but three of them against Wall Street reform. There's nothing mysterious about Boehner's plans as Speaker either. The GOP's new Pledge to America  crafted by Brian Wild, a former lobbyist for ExxonMobil and AIG who recently joined Boehner's staff  is vague but blunt: more tax cuts, less regulation, more drilling, less spending in the abstract and a rollback of just about everything Obama has done. After a recent speech, when a TIME reporter pressed him about how he could solve the nation's debt crisis while slashing taxes and not touching entitlements or the military, he fell back on generalities about controlling spending and getting Americans working again. His staff says one of his first orders of business as Speaker will be a bill proposing $100 billion in unspecified cuts, but he was much more revealing during the rollout of the Pledge: "The point we make in this preamble," he said, "is that we are not going to be any different from what we've been." It's an odd message for an angry electorate, but it rings true. Boehner isn't any different from what he's been since he arrived in Congress 20 years ago. Boehner may fit the profile of a country-club Republican, but he grew up in a blue collar Democratic family in Reading, Ohio, near Cincinnati. His dad owned a bar, and his mom worked in a cafeteria before she started having children. John was the second of 12, and he and his older brother Bob were in charge of making sure all the chores got done. "You learn to compromise in a family that big," recalls Bob, who lost his job as a Reading city official in February. "And John got pretty good at talking people into doing things." Boehner's friend Jerry Vanden Eynden, now the president of a Cincinnati candle company, remembers those days a bit differently: "John would bark out the orders  and then we'd leave!" But Boehner always had to work. He waited tables and tended bar at his dad's tavern, known as Andy's Café, an experience he's credited with preparing him to lead a caucus. He woke up at 3 a.m. to deliver Sunday papers, always taking a break for 6 a.m. Mass. He drove bulldozers and worked roofing jobs, even though he was afraid of heights. He did get a break during football season. His high school coach, Gerry Faust, remembers him as a serviceable linebacker and long snapper who once played in a big game despite back spasms. "I said, 'John, you're in no shape to play.' He said, 'Coach, I'll get it done,'" says Faust, who later coached Notre Dame. "Hard worker, team player." Back then, nobody dreamed that Boehner would end up where he is. 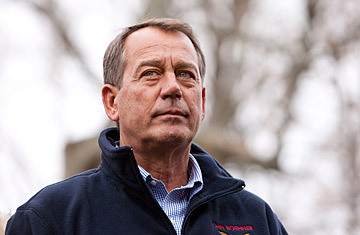 Asked whether Boehner was a team leader, Faust replied, "He was one of 38 seniors. They were all leaders." He was not an exceptional student and took a job as a janitor after high school. His brother Bob says Boehner might have skipped college if he hadn't started dating the woman who was to become his wife: "He needed an education if he was going to get anywhere with Debbie." (They're still married and have two adult daughters.) He took night classes at Xavier University in Cincinnati for seven years, finally graduating in 1977. He then landed a sales job at a small plastics firm and worked his way up to president and part owner of the company, becoming a self-made millionaire. "He was an aggressive salesman, and he really knew how to take care of his customers," Vanden Eynden says. Boehner's business experience pushed him into the GOP  he felt overregulated and overtaxed  and into politics, first as the head of his homeowners' association, then a township trustee, then a state representative and finally a Congressman in 1990. He quickly made his name on the Hill as a young reformer, leading the Gang of Seven that helped elevate the previously obscure House bank  and the members whose overdrafts made it a scandal  into a powerful metaphor for the congressional entitlement mentality. He became a trusted Gingrich deputy, a leading spokesman for the Contract with America that helped the GOP take back the House in 1994. He was elected conference chairman and began convening a weekly strategy session with sympathetic business lobbyists known as the Thursday Group. If Gingrich was the rabble-rousing bomb thrower behind that Republican revolution, Boehner was the steady hand trying to keep it on track. He focused on the politics of the possible. Even though he had always yearned to abolish the Occupational Safety and Health Administration, which he considered a red-tape monstrosity, he urged firebrands in the conference to push less dramatic but more achievable reforms. Nevertheless, after Gingrich's excesses cost him his job as Speaker in 1998, Boehner was ousted from the leadership as well and exiled to the chairmanship of Education and Workforce. Upon learning the news, Boehner went back to his offices and calmly told his staff, "We'll survive." He didn't sulk. He legislated. The new GOP leadership tried to stop his bipartisan outreach on No Child Left Behind, but Bush took his side, and the deal got done. So did pension reform, even though Boehner took some flak for trying to slip in a perk for hedge funds. "John had the opportunity to fold his tent, take his ball and go home," says Georgia Senator Saxby Chambliss, one of his closest friends. "Or he could lick his wounds and live to fight another day." See TIME's list of 10 Republican surprises.